This is a recipe I sort of made up after seeing something like it in one of my "imported" food magazines – Olive, Delicious, etc. With all of the expensive foreign food magazines I buy every month, it’s a wonder I have money left to cook any of it with! I somehow lost the magazine, but the idea stuck with me. This dish is me winging it. Seared scallops are a favorite of mine, regardless of the preparation. The garam masala gives them an unusual taste. There are great flavors and colors going on in this recipe and the best part is…it’s done in about 20 minutes – about as long as you need to finish the rice. If saffron is too rich for your blood, tumeric is also wonderful in the rice. – In a covered saucepan, add the saffron to the broth. When this is brought to a boil, add the rice, salt and pepper. Reduce heat, cover, and simmer for 15 minutes. When rice is almost done, add the peas and red chili. Cover and cook for 4-5 more minutes. – When you add the last ingredients to your rice, drizzle pan with the olive oil and bring to medium high heat. Salt and pepper the scallops and dredge each flat side in the garam masala. Sear each side 1-2 minutes until the scallops are opaque and firm. Overcooking here will be the downer of this dish, believe me. 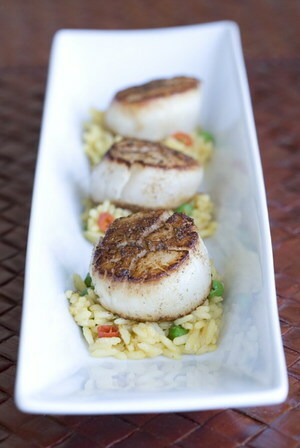 – Remove rice from heat, fluff, and plate with the scallops on top of the bed of rice. Tami, wow. that looks so delicious. A++ for presentation and photography. Those look fantastic. I love scallops, especially when they have that beautifully seared taste and texture. By the way, as a food stylist do you not get to write off food magazine subscriptions as a business expense? No offense to the secret admirer, but people always come off creepy to me when they say someone is *yummy*. shudder. This sounds wonderful. I haven’t tried cooking scallops before, but this dish looks like a great place to start! First time to your blog… but I will be back! Beautiful picture. This looks so yummy. Great Blog! I know the magazine Olive you mentioned as I live in the UK. There used to be a really good on called EATsoup. I think you would like if you could find some back copies as it does food, recipes, travel and has “edible” photos.